The onset of September means only one thing: fall is almost here. While fall in LA may not produce the same foliage wonders that other coasts are privy to, the fall season marks a time to settle from the summer madness and focus on the most important person of all: you. Trading backyard BBQs and weekend festivities for shorter days and cozy activities allows us all to pause, refresh, and focus on some self-care. After all, there is no better way to ease into the season after a summer of fun than with some relaxation and reflection. Not sure where to start? Here are some of our fall-themed favorites and self-care activities that will make the season pure bliss. 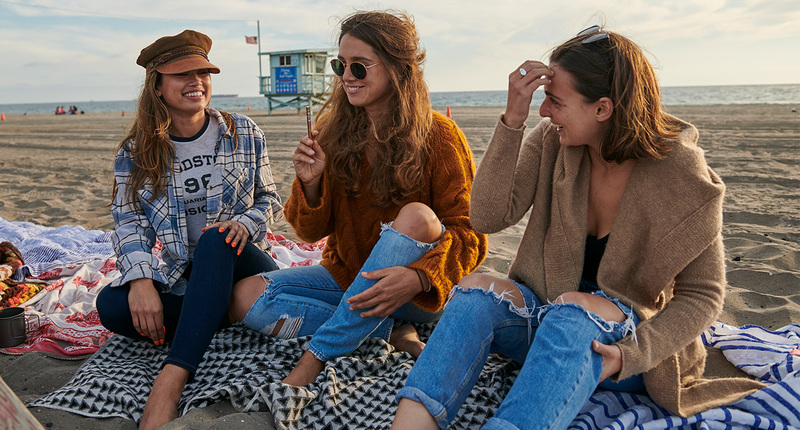 Before it gets too chilly, we suggest grabbing some buds and heading outdoors for some end-of-summer activities. There’s nothing better than waking up a tad bit early on a Sunday and hiking one of LA’s many trails. From Griffith Park to the Malibu spots that border the ocean, get your blood pumping and take in the beauty around you. Before you head to the hills we suggest a bite or two of the Korova Mini Saturday Morning Cookies—a little high will get you in the zone and ready to immerse yourself in nature. Nothing says fall quite like cinnamon, and Breez’s CBD Cinnamon Mints bring the seasonal spice to a whole new level. Tasty and calming, they offer up an ideal addition to any fall activity, be it a movie night, pampering session, or even a splurge-worthy massage. There is something magical about being at the beach during its off-season. Smaller crowds, colder breeze, and lots of room to take it all in. Enjoy some quiet time on the beach with the delicious cannabis-infused Strawberries in Dark Chocolate from Satori before taking a romantic sunset stroll that still brings some of the perfect tones of summer into the mix. Another favorite of ours is beach yoga. Enjoy a few inhales from the Dosist Calm Dose Pen before bringing out your mat to truly reach that state of nirvana. We love the idea of taking full advantage of this Southern California life and getting some zen in with a bit of yoga that just so happens to be set to the sounds of ocean waves ebbing and flowing. Whether you are gearing up for a binge-watch of your favorite show or have a fresh flick queued up, there are numerous cannabis goods to get cozy indoors and enjoy a calm night centered around some film and TV. Before you press play, make yourself a cup of tea. Our favorite brew? Kikoko’s Positivi-Tea and Tranquil-Tea. With a mix of THC and CBD, a cup of Positivi-Tea or Tranquil-Tea is a balanced mix of cannabis that helps to boost your mood and bring on the calm. Become one with the couch with Chill’s Acai Berry Blast Dark Chocolate with CBD. The antioxidant-laden dark chocolate and acai get an added boost with a bit of CBD, making this treat perfect to pair with a booze-free night in. We love some good detox action once summer winds down. Forget about boring smoothies and juices—supercharge your health-centric beverages with some CBD infusion. MedMen has countless CBD oils that make for a perfect smoothie addition. From the Care By Design CBD Rich Drops that boast a 4:1 ratio to Fiddler’s Greens Kindred Spirit Olive Oil, your health game will be both delicious, calming, and perspective-shifting. When all else fails, grab a bath bomb and head to the tub. One of our favorites is Kush Queen’s Relax CBD Bath Bomb. The nourishing, pure CBD bath time accompaniment is a surefire way to banish any stress or bouts of sleepless nights. And there you have it—the perfect list of fall favorites that will certainly make it a breeze to say goodbye to summer. Bring on the sweater weather!